Entering the funeral home, I immediately hear laughter and friendly chatter. There is standing room only as friends and family spill out into the foyer. My mood is lightened; this will definitely be a celebration of life. While I had not seen her in years, she played an important role in my life; colleague and mentor, my journey into administration began with her encouragement and support. I remember how proud she was when I shared the news that I had been hired for an administrative position in another district. We stayed in touch, until a rare form of dementia stole her mind. That was nearly eight years ago. A few weeks ago, it finally took her life. The staff quietly hustled to add more chairs as the service is about to begin and I take my seat. Now I stare intently at her picture on the small program I received upon arriving. I remember her smile and her twinkling eyes. With a heavy sigh, I wonder how someone so vibrant and alive can quickly become a vacant face. Life has cheated her and us, and it doesn’t seem fair. After contemplating the ways of the Universe, I lift my head and glance around the room, row by row, so many familiar faces from long ago. Some of their names come easily, and others I struggle to recall. A few of my current colleagues are in attendance as the world of education is so small. Now I search the room for the faces I expect to see, the ones I hope to see. It’s funny; when you really know someone well they can be easily recognized by the back of their head, even after eight years. . . . and there she is. I am immediately anxious and nervous, taking short quick breaths, my heart races. Of course I expected to see her, but I did not anticipate my reaction. I consciously slow my breathing, close my eyes and listen to the beautiful words of a dear friend as he shares a story. After a few moments, I find myself back in the present, smiling and laughing as we remember a very special woman. The service comes to a close, and folks crowd into the reception area. I talk with a few colleagues. I am standing just a few feet from her, waiting patiently for the right moment to speak, wanting to approach in the least intrusive way. I pretend to be occupied with my purse or my phone while I watch for my opportunity. In my head, I begin to compose all that I will say, knowing that she could politely turn her back on me. I hear words that indicate the conversation is coming to a close, and I gently touch her arm. She turns to face me, surprised, smiling broadly. She hugs me tightly for what seems to be an eternity and I want to cry. I wonder . . . Has she forgiven me? She pulls away and asks how I am, and how my family is doing. I struggle to find the words and manage a couple of okays and then I say, I really miss you. Somehow I feel like she knows life has been tough for me lately, and she tells me that in spite of everything that happened in the past she only wishes me the very best and she repeats herself several times, only the best. She feels compelled to explain why she ended our relationship; It was all just too close she says. She thanks me for a card I sent her a few years ago, an attempt at mending our friendship, so thoughtful she says, it was all just too close. I feel tears in my eyes and on my cheeks. I wipe them quickly, and I am composed. I tell her again that I miss her, I hug her one more time and we say goodbye. Driving home, I think about the mistake I made, falling in love with a man who was not available to me, or mine to love. It was not her husband, but the husband of a mutual friend. He chased me, loved me, and we turned the world upside down for a little while. He broke my heart and went home. Everyone’s lives went on as if I never existed. I paid dearly for my mistake. I hoped that enough time had passed, and that she could forgive me. After seeing her, I realized she had forgiven me a long time ago. I do believe her good wishes for me are sincere. But she is not going to be my friend . . . . and that’s okay. It’s a shame that I spent so much time focusing on my mistakes, wishing for forgiveness and missing someone who had let me go. Another pattern ever present in my life, another lesson learned, time to let go. As I sit on my bed in the early morning hours finishing this story, I smile thinking about all the beautiful stories shared about our dear friend and colleague who passed away. And then it dawns on me. . . . she created her beautiful story by the life she lived purposefully every single day. Her story is the gift she leaves for us to tell in her honor, and as an example to follow. Today, I live an honorable life. 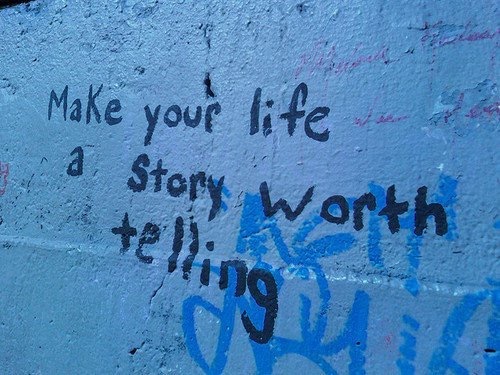 I am creating my story, it gets better every day, and one day it will be told. You have such a gift when it comes to writing and you are still my favorite blog to read. I’m glad you have found some peace inside with this particular topic. May the joy now surpass the pain and wash it away leaving only the treasure of you refined revealed and glorious. Sometimes our head and our hearts don’t agree. One can be swept away in a current unaware. But perhaps whether we float softly on the edges or are taken up by the rushing, the whole stream is moving toward the same destination. Peace and joy. I just hope you smiled. You are brutally honest in this piece… This is very refreshing. Keep up the great work. You have a tender heart! You share you heart in this piece… Very refreshing. You are a beautiful work in progress! Thank you for stopping by to read. I appreciate the encouragement. You took a chance on love and risked it all, but ended up losing him plus 2 friends. For him it was lust, so he had his affair and went back home asking for forgiveness and a second chance. Be wary of men who risk nothing in love. It’s true us women judge each other very harshly and ourselves even worse. I am sorry for how things turned out and for the pain this caused you. I hope you continue to take a chance on love, you are wiser now and you can trust yourself to make good choices. You have a lot of love to give, give of yourself so generously and most importantly deserve to be loved just as much. I continue to admire your ability to face pain so bravely, analyze it and express it so beautifully. I know your writing is therapeutic for you. My wish is that with every story you write that the pain is left on your written words and that your heart is free from it. Take a chance on love, forgive yourself, don’t judge the choices you made then with your current wisdom…you were just a loving and trusting person then…now you are a WISE loving and trusting person and will make far less mistakes. Beautifully written Christine. What a great place to share and to touch others heart, and soul, and mind . I love to learn through comments who is reading my blog 🙂 Thank you so much. Wow.. it’s damn hard to reconnect with people you’ve fallen out with, it’s so awkward, stressful and painful but also so so healing. This reads like a song about wisdom and compassion. What a pleasure to find. I’ve been waiting to find you! 😉 How profound the wisdom through your writing, how compelling your story delivery! Thank you thank you for your encouraging words. Honestly I am surprised every day that people are interested I. What I have to say. When I saw your picture you were so familiar. I thought Beth had changed her hairdo. Sister bloggers. I love it!!! Love it too! DNA sisters who’ve had a wild and bumpy ride that could have shattered amateurs! I saw your blog last night and wanted to read it but I was too tired and wanted to get the full enjoyment. Then I was off at 7:00 am and didn’t want to feel rushed. So now, after working, workings out, taking dogs to the beach(separately)I finally get to sit and just soak up your words. You write so beautifully and are so brave that I can only imagine how many people you have inspired.